Austin Furry Dance organizer Whines gives a Q&A for the Furclub Survey. Furclubbing: “A repeat/regular nightclub event by furries for furries.” It’s a New Thing that’s been spreading since the late 2000’s. This kind of dance party is independent from conventions. This builds on the growth of cons, and takes things farther. It’s more ambitious than events that happen once, house parties, or informal meets. Those can stay inner-focused for friends who already know each other. This brings partnership with venues that aren’t hotels, and new supportive interest in the kind of events they host. It crosses a line to public space. A stranger may walk in off the street to discover their new favorite thing. It encourages new blood, and crossover to other scenes. It makes subculture thrive. It’s a movement! 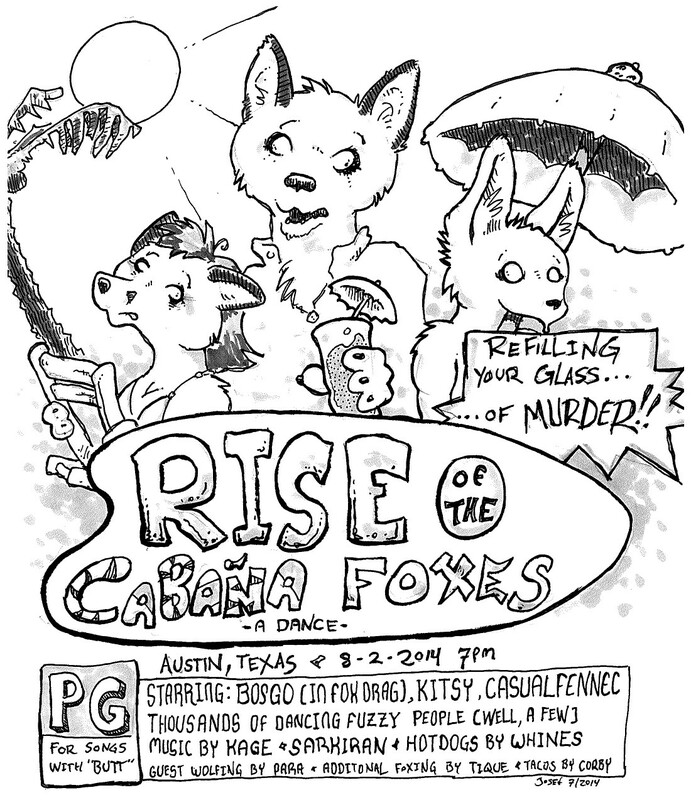 The Austin furry dance is a continuing series of events that happen every 2-3 months. Each dance has had its own name–‘Maybe?’ ‘Do Not Look Into Laser With Remaining Eye’, ‘Foxing Days Until Xmas’, ‘Chick Rock’, etc. I guess the series is the Austin Furry Dance? Who: Founder, promoter, staff, DJ’s or performers? I (Whines) have pushed this along with lots of cooperation from the Austin community and my partner Corbeau. EJ Otter, the head of the University of Texas furry club has gotten us much bigger spaces over at the University for events in partnership with his club. His boyfriend Rheldar does a lot of the A/V work along with myself. Edgewise has been DJ’ing for us nearly since the beginning, sharing the duties with others including Kage and Corbeau. What: Type of party, music, price, amenities, attendance? These are dance-focused private parties, with invitations by referral so we can have some control. The musical style is deliberately diverse; there’s always club EDM (of course) but some 70/80/90’s, electroswing, or international thrown in. DJ’s with different styles are paired up to keep it changing. Price has always been zero, with kind community members donating snacks/drinks. We keep blower fans pointed at the dancefoor (SO wonderful in a fursuit!) and recently added a drying tree. Attendance is usually in the 20-30 range although it’s been up near 50. When: How often and how long? When established? Where: City, venue? What furry scenes does it draw from? 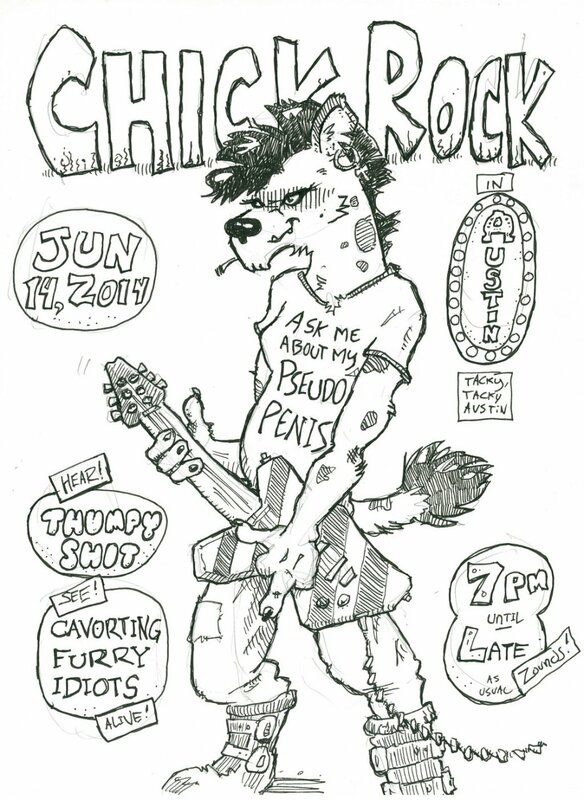 Austin, Texas…and the attendees are mostly local furries who know one another, but there are frequently visitors from other parts of Texas. Vibe: Adult or general, gay or straight, age, how much costuming, general public or only furries? It’s the usual furry mix, equal slices of gay/bi/straight, mostly but not exclusively male. Usually there are a handful of fursuiters, 5 or so, but the number has been growing as attendees build/buy costumes over time. Since it’s a private party there hasn’t been public attendance (although non-furry friends and family have come by to dance) but this may change with the move to the UT Student Union. We’re trying to reach out to the cosplay community, hoping they may be interested in sharing events…I hear from Nullstrukt that the communities mix well in his part of the east coast. Promotion: How did it spread the word? Promotion has mainly been word of mouth, although I do posters because it’s fun. The event is posted to some of the Texas furry forums and Furaffinity with the ‘contact us if interested’ tagline. I don’t think there’s any awareness of us outside the local community, but since switching to the Union there are definitely some curious looks from passers-by. 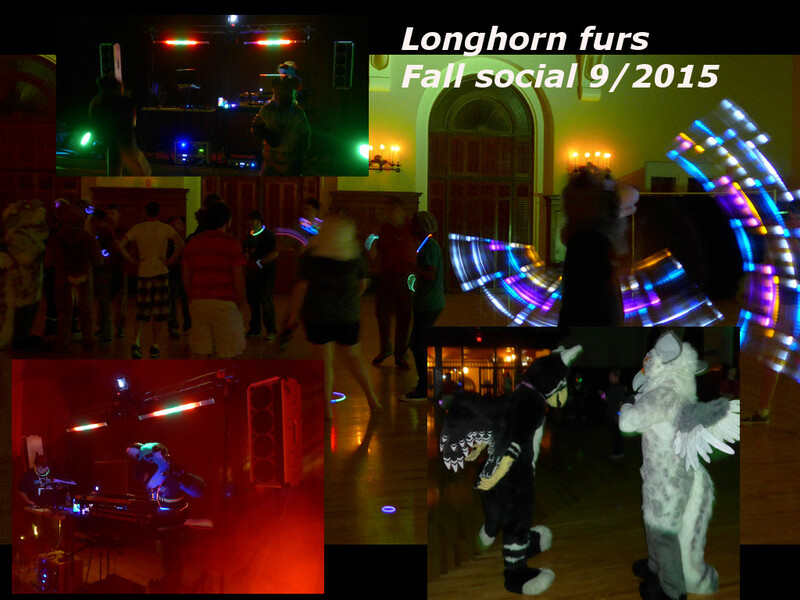 The Longhorn Furs were recently in the student paper and mentioned the dances in their interview…it’ll be interesting to see if this increases interest. Reactions: From the community, press, venues, other scenes, bystanders? Again, very little exposure yet. We’d love to see more cosplayers participating but have not found a good connection to that community. Our ability to put on a good show has been developing; the first dance had a single DJ who was still figuring the whole deal out and that was pretty rough, but we’ve been doing better since! Business: Regulations, costs, door or drink costs, merch? Growing or stable? We’ve looked in to space repeatedly and it’s expensive. I don’t want to turn this into a business or make it alcohol-centric. It’s a labor of love and a place that a lot of people who would never go to a club can get together and dance with friends and fursuiters. Honestly I’m suprised it’s gone this well; a lot of furries are shy outsiders (inluding myself!) and it’s asking a lot to get them to dance…but in the right environment they’ll give it a spin, and that’s awesome! Good story about attending? Video or pics? At one of the recent dances, one of the newer members of the Austin furry community, another older tech guy like myself, was there dressed up in his Dr. Who cosplay and dancing along with everyone else. He’s a shy guy, but that didn’t stop him from participating and having fun, even without the quasi-anonymity of a fursuit. That is awesome and that’s what I’d hoped for when I started putting these together! There are plenty of nicer professional venues for dancing, of course, and if one wants to stand out as a performer infiltrating a non-furry event in costume it’ll get you more attention. Specifically furry dance events are more about community, though, or dipping a toe in the water for those who aren’t used to dancing or clubs. A comment I’ve heard at cons is ‘I stopped going to the dances because they always play the same sort of music.’ I think that was spot on and unfortunate. DJ’s or organizers will sometimes defend their choices by declaring that they know exactly what sort of music is being played in clubs, and that’s great, but a furry dance at a con or elsewhere is not a typical club. It’s a much more diverse group of people, old and young…more like the crowd that a wedding DJ works with than a club DJ. Wedding DJ’s aren’t glamorous, though, so the volunteers would rather play the part of the club DJ and that means playing what club DJ’s play, avoiding a lot of ‘cheesy’ crowdpleasing stuff. I worry that the volunteer DJ’s at a lot of furry events are sometimes more interested in honing their craft or showcasing their specific musical tastes than trying to entertain the whole crowd, and while it’s understandable–if you’re working for free and probably given no guidance why not play to your own tastes?–the overall event can suffer. Context is important! If you have a lot of clowns wearing costumes in your audience, give them something to work with. I’ve seen hilarious improptu performances from fursuiters acting out the lines of 80’s pop tunes. You can’t do that to endless techno that is only punctuated by the occasional bass drop. I’m not saying only ever program Village People and the Hokey Pokey, but if your DJ’s collective musical tastes have too much dignity to play along with a very silly crowd of animal people, perhaps their performance is being aimed at the wrong audience. When getting started I’d try to have conversations with DJ’s about the music for an event, but I’ve backed away from that because it tends not to work well. (they certainly can’t play music they don’t physically have) Instead, try people out, see what sort of thing they can do, and make a program for the evening from that. (Patch:) This is great! Neonbunny is our local furry dance promoting DJ and I think he has a different philosophy of getting “quality DJ’s” who may play their own style… it’s all relative to where you are, size of crowd, etc. I think whatever works for your event is best. It takes a lot of effort to get people together so if it works do it. I have gotten introduced to a whole different style of music than I liked before from going to furry dance clubs. I think if you can afford a lineup of different styles that’s a good approach. The SoCalFurs have been having barbeques and beach parties since the 1990s, I think — at least for ten years — but I haven’t seen them profiled yet on Dogpatch Press. It’s similar to CaliFur; Southern California furries just don’t think in terms of publicity. Hi fred- havent covered many bbq or informal house meets. Bowling is another one that could get it’s own list since it’s more public and somewhat promoted and there are some big long running meets for that. I gave especial attention to dances as being the strongest base for a “movement” though. They cross over with other scenes (music and performing), I think the venue partnerships are stronger (since some clubs depend on bringing committed regular entertainment), and they need to promote to reach a certain bar for attendance. Other meets don’t do that.